A branch of the Union Bank was opened on July 1, 1857,  and this building was constructed in 1863-64 to 'the design of Architect Leonard Terry. It was sold by the Union Bank to the H.B.A. in 1951. There is limited information regarding this building. 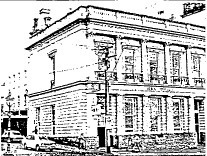 However it is one of Terry's finest designs with full Doric columns unmatched 'in any of his surviving works in Victoria, but which he had used in the London Chartered Bank in Melbourne (since demolished) and the Old Union Bank in Launceston of 1865. Here however the ground floor collonade is grandly matched by an upper collonade in unfluted Corinthian columns, resulting in a unique superimposed trabeated system. Behind t colonnades is a conventional Terry facade of ruled masonry courses at ground floor level and hooded windows in the piano nobile with projecting balconettes. The Greek revival character is maintained in the diagonal patterned transom lights above the door, and in the iron scroll work of the balconnettes. This building is in good condition and is relatively intact apart from the new front doors and inappropriate paint work. In the entrance hall the ceilings and cedar work are preserved. It is extremely important architecturally, and is possibly one of Terry's finest designs. It provides a strong streetscape element to the Lydiard Street precinct.